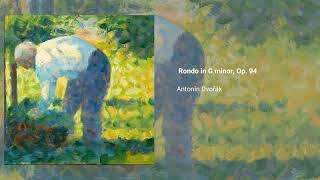 Antonín Dvořák wrote his Rondo in G major, Op. 94, in 1891, and first published it three years later. The piece, a simple movement for cello and piano, was also catalogued as B.171, and dedicated to Hanuš Wihan. A version for orchestra was also produced by Dvorak in 1983, and published together with the piano version, as B. 181. The orchestral version calls for cello solo + 2 oboes, 2 bassoons, timpani, violins I, violins II, violas, cellos and double basses. A standard rendition lasts about 7 minutes.